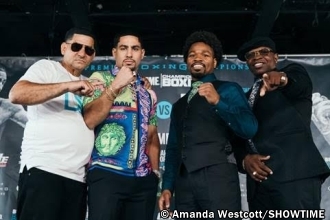 WHAT: SHOWTIME Sports® Emmy-award winning reporter Jim Gray sat down with the fathers of Danny Garcia and Shawn Porter as the two former world champions prepare to meet September 8 for the vacant WBC Welterweight World Championship on SHOWTIME CHAMPIONSHIP BOXING. Live coverage of the SHOWTIME CHAMPIONSHIP BOXING telecast begins at 9 p.m. ET/6 p.m. PT and also features top 147-pound contender Yordenis Ugas (22-3, 11 KOs) taking on Argentine slugger Cesar Barrionuevo (34-3-2, 24 KOs) and unbeaten Polish heavyweight contender Adam Kownacki (17-0, 14 KOs) facing former heavyweight champion Charles Martin (25-1-1, 23 KOs). The Premier Boxing Champions event takes place from Barclays Center, the home of BROOKLYN BOXING™.